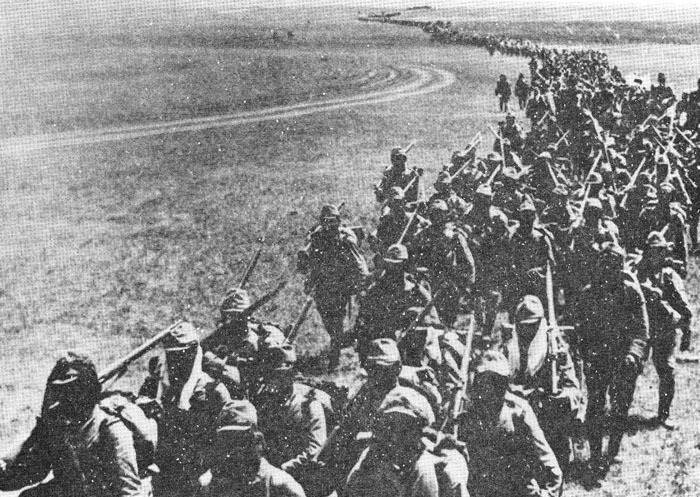 Japanese forces marching against the Soviet at Khalkin Gol. Soviet-Japanese Military Action - Japan had been aggressive with its military throughout the 1930s. It confined that activity largely to the Chinese mainland, incurring little notice in the Western media. By and large, horrific as the human toll was, these military raids had little consequences extending into World War II. 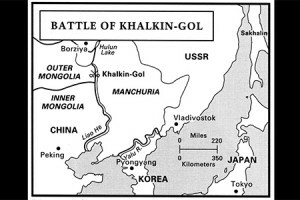 However, one did: the Battle of Khalkin Gol. Japan had occupied Manchuria (north of Korea) in 1931 and turned it into a puppet state named Manchukuo. This brought the Japanese into direct contact with the Soviets in Mongolia, removing the buffer between them. The result was a series of border incidents due to disagreement about the true border between the two adversaries. You might think that the Japanese, having absconded with such a huge territory, would just take a pass on pressing a meaningless border issue so as not to look a gift horse in the mouth, but it was the 1930s and everyone was in everyone else's business. Actually, somewhat surprisingly, headquarters in Japan did take that reasonable attitude. It was one of its last prudent military decisions. But this order was ignored. 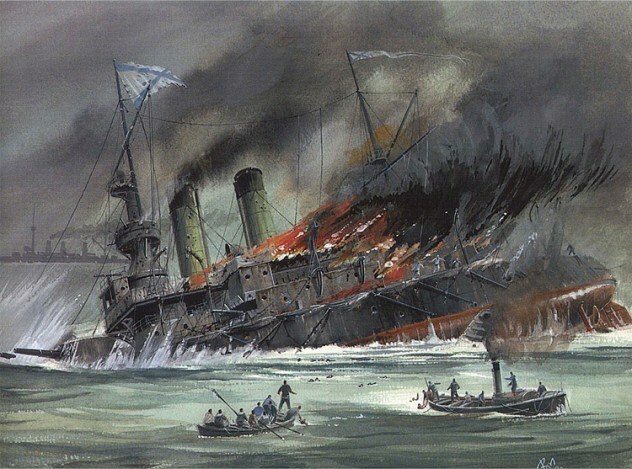 The 1905 Battle of Tsushima off Korea was an epic Russian disaster that lingered in everyone's memory through the years. The Battle of Khalkin Gol turned the tables. So, in a fit of common sense, Imperial Japanese Headquarters told the local army to stand down. However, the Japanese Kwantung Army was a loose cannon outfit which pretty much did what it wanted to do, led by leaders who fancied themselves crusading warlords. It ignored Tokyo and decided to settle the border issue by simply taking the disputed territory. The Kwantung Army began inconclusive skirmishing with the Soviets in May 1939, but this led nowhere. The Japanese then decided to settle matters once and for all in July. They sent in two roughly division-sized forces in a two-pronged assault designed to encircle Soviet forces on the river Khalkyn Gol. It was a classic double encirclement, then novel in modern warfare (though the tactic dated at least to the time of Hannibal) but much-practiced later in World War II. The Japanese plan might have succeeded, but they were facing one Georgy Zhukov. 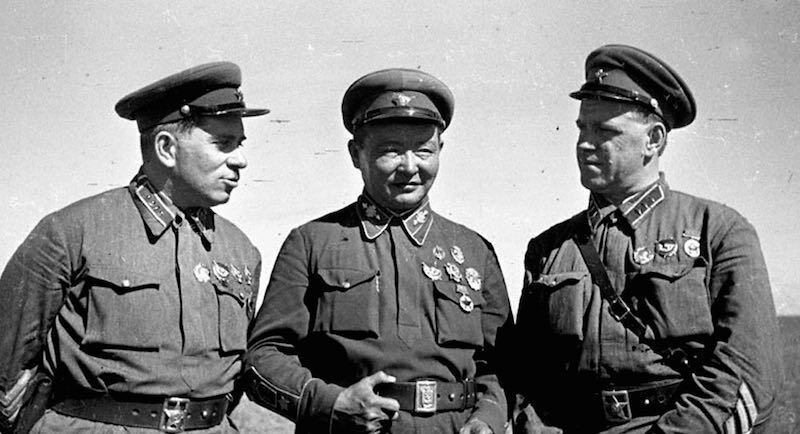 Zhukov was to become famous during World War II as quite possibly the best General of the conflict, but at that time he was just a corps commander. He took over on 5 June 1939, bringing along reinforcements (part of being a favored General in those days was that you got stronger forces allocated to you than would otherwise be the case). Zhukov had literally hundreds of tanks, which he was not chary about using, making the operation a full-scale battle on a par with many of the famous engagements of the war. It was basically war games with live ammunition, because everyone knew it would not evolve into a wider conflict. While the Japanese claimed to have destroyed more Soviet tanks than they lost (also a common claim by the Germans in subsequent years), ultimately they were repelled. The encirclement failed, the points of the attack failed to join, and the Japanese commander Yasuoka Masaomi was relieved. While the Japanese attack had failed, they had occupied some territory and remained in their advanced positions. They may not have achieved their objective, but they also technically had not lost. Zhukov decided to settle matters. On 20 August, he attacked with three rifle divisions, two tank divisions and additional tank forces organized into two brigades. While Soviet divisions in those days were smaller than those in other armies, it was still a substantial force of about 500 tanks (while composed of weak BT-5 and BT-7 models, these were more than capable against the Japanese forces which were very light in armour). The Soviets also had some 557 aircraft and 50,000 men. The Soviets faced only one Japanese division - the disadvantage of having a failed encirclement was that the Japanese forces remained separate and could be defeated in detail. By the end of the month, the Japanese forces had been wiped out. A cease-fire was arranged in Moscow shortly afterwards, made easier because now (temporarily) they essentially were on the same side against the Allies. Japan saw that the Soviets would not be an easy opponent and looked in other directions for future conquests. While it is dangerous to read too much into an isolated, basically inconclusive (in a strategic sense) engagement, the Battle of Khalkhin Gol had drastic consequences for world history. Due to this battle, Stalin felt free, especially given the intelligence received from Soviet spies such as Richard Sorge, to reduce his defensive strength facing Japan to the bare minimum during the darkest early days of World War II in 1941. This contributed to the successful defense of Moscow in December 1941 and the subsequent successful Soviet counterattacks. The battle also dissuaded the Japanese from attacking north in 1941 against the weakened Soviet Union, which would have made much better sense from a strategic perspective than what they chose to do. Ultimately, Japan attacked south for "easy" conquests, and this had catastrophic - actually fatal - consequences for the Axis. Zhukov at the Khalkhin Gol battle.